High property prices push Russians to seek alternative housing. People in Moscow sometimes live in the most unexpected places. One recent trend is particularly unexpected: ordinary garages converted into quite comfortable homes. Who decides to live in non-residential premises and why, and what does everyday life in a garage look like? Every day, Oleg Mudrenko, 41, leaves his garage on Moskvorechye Street and goes to work in central Moscow. He heads the Moscow branch of a large Czech machine engineering company. Oleg goes to work by public transport, and the journey takes him a mere 30 minutes. He keeps his car in the garage where he lives, on the second floor. "I have a flat in Moscow Region, but it takes too long to travel from there. If you are good at DIY, turning your garage into a place for living is not that difficult," says Oleg. The garage is heated with electric and gas heaters. Oleg has no fear of freezing here during the winter. He has managed to sort out running water, too. At first, he thought of drilling a well, but it turned out it was easier to get water tanks on the roof. Oleg buys drinking water and uses filtered rainwater for all other needs. "There is quite enough water for two or three people," Oleg says. He likes to invite friends around, and they like coming here: They see the place as more of a dacha country home. There is a canteen and a grocery store right there, on the property of the garage cooperative. Many garage cooperatives in Moscow have been turned into residential areas. Oleg says there are five more people living in garages near him. More importantly, Oleg paid just 430,000 rubles (some $13,000) for this two-story "townhouse" of his own, just 15 minutes from the nearest subway station. Indeed, Oleg is far from the only one to have turned his garage into a place to live in. This seems to be developing into a new trend. If you visit a garage cooperative in the evening or during a weekend, you will see that the place is full of life. Owners build second floors on top of their garages, to have a place where they can rest or gather with friends. Whether they then stay to spend the night or live in the place is nobody's concern, as security guards are not there to police the owners. Alexander Lappo, 25, came to Moscow from Belarus three years ago. Since then, he has moved from a flat to a garage cooperative several times. "When I ended up without a place to live in and my friends invited me to stay in a garage, at first I thought it was a crazy idea. But then I realized that it was quite a normal thing for Moscow. Having tried it first-hand, I soon figured that one could easily live like that," says Alexander. According to him, garage cooperatives in Moscow have long turned into real villages populated by dozens, if not hundreds, of people. The main drawbacks of living in a garage, Alexander says, are poor ventilation and lack of a proper sewerage system. Another problem is security: There are quite a few suspicious individuals in garages at night, but calling the police is problematic since the place does not even have an address. Residential garages are even available to rent for just 8,500 rubles (under $260) a month, whereas renting ordinary accommodations in Moscow for the same kind of money has long become a thing of the past. Still, not everyone would agree to live in such extreme conditions. 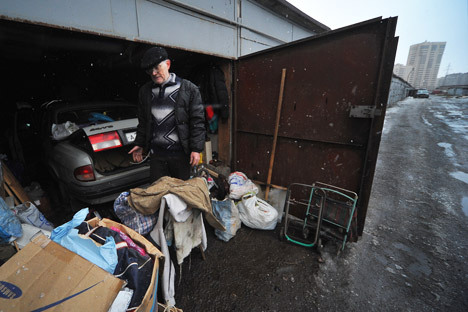 There are many visitors to Moscow among garage dwellers, says Alexander—although there are Muscovites and people from Moscow Region among them who use garages as temporary or permanent accommodations, too. Judging by classified ads, this type of accommodation is particularly popular in the south of Russia, in Krasnodar Territory. One of the most upscale offers is a 540-square-foot luxury garage in northwest Moscow, just a seven-minute walk from the nearest subway station. The place is decorated with modern furnishings and has not only a shower cabin, but even a piano. The press secretary of the Federal Migration Service's Moscow division, Sergei Aksenov, confirms that immigration officers have found illegal immigrants living above car washes. "In Moscow, there are people living everywhere. We have found people living in top-floor elevator shafts, in shop basements. We have even come across illegal immigrants living in a cemetery, in a dugout they had made for themselves. After seeing that, I am no longer surprised at anything," Aksenov says.